In July of 1911, Picasso went to the French Pyrenees town of Céret, and there waited somewhat impatiently for Braque to arrive so they could continue annihilating traditional notions of artistic representation. 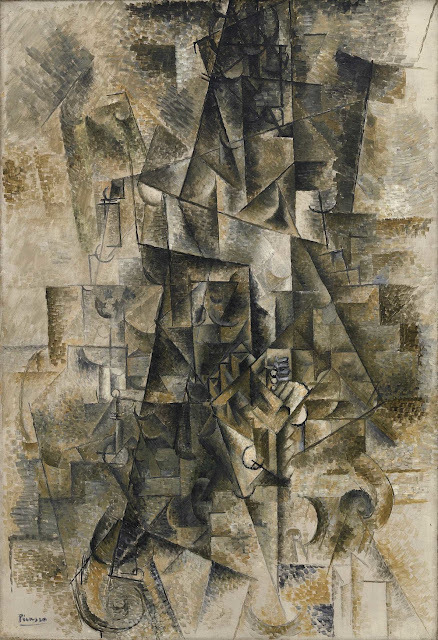 We can thank noted art historians - Roland Penrose, Douglas Cooper, John Golding - for amalgamating anecdotal material on Picasso and Braque’s cubist collaboration. Braque said he and Picasso were “mountaineers roped together,” and Picasso called Braque “his wife.” Picasso’s assertion that for a while their work was so similar they were unable to distinguish by whom it was made is rhetorically enshrined. It was John Richardson who mined correspondence to offer the enlightening commentary that in Céret Picasso acquired a monkey whose testicles he admired. The animal had “two noble balls,” Picasso told Apollinaire in a letter. For many, Picasso’s 1907 Les Demoiselles marks the beginning of cubism, although I make the case for his 1906 Portrait of Gertrude Stein, but it requires a close look at the interlocking planes and angularity in that rotund figure’s facial features to accept this as plausible. What is irrefutable is that the paintings Picasso and Braque created while working in Céret, Picasso’s 1911 Accordionist and 1911 Landscape at Céret, and Braque’s 1911-12 Le Portugaise and 1911 Rooftops, Céret, represent cubism at its most perfect moment. Their innovative practice was to disassemble pictorial form by means of fragmentation, faceting, planarity, angularity, atonal coloring, and unexpected translucence, the result being masterpieces of analytic cubism that revolutionized art. Picasso’s seminal Accordionist is included in the Museum of Fine Arts, Houston’s Picasso Black and White exhibition, and is the inspiration for this essay. Like Richardson, David Sylvester had profound appreciation for the work completed by the two artists at Céret and assigned “unassailable authority” to the early cubist paintings, but not without making a catty remark about Richardson. Sylvester said Richardson understood the extent to which the artists inspired each other, but insufficiently grasped their mysterious intellectual bond. In the process of subverting six centuries of European painting, Sylvester wrote, Picasso and Braque “achieved a perfect combination of intellectual curiosity and instinctive response as they worked away as if under a spell.” “The mystery isn’t quite evoked by Richardson,” he continued, “but perhaps it is impossible for a book to be both a thorough biography and an altogether satisfying critical study.” Did Sylvester hiss at Richardson because Richardson is a better writer? Let me recommend art historian Robert Rosenblum’s writings on early cubism. He offers a fine encapsulation of the era’s stylistic developments, and is particularly helpful with the distinctions between analytic and synthetic cubism. Rosenblum’s is an intellectually elevated, multi-disciplined approach to early cubism, as illustrated below. Picasso Black and White, which includes Accordionist, is open through Sunday, May 27, at the MFAH. Thank you, Robert, for bringing these interpretations together. Not sure about the "truth" being an aim of visual experience by these two giants. Harvey--Thank Virginia Billeaud Anderson. She wrote this piece.